Can you believe 2019 is just a few, short days away? Neither can I! This past year has flown by and I’m still trying to figure out where it went. While 2018 was great for Pam and me, we never want to sit on our laurels. We always want to see bigger and better things for our lives and the lives of those we serve. That’s why I’ve been looking at ways to make 2019 my best year ever. These are just a few of the good things that happened in the last year. You’ve had similar victories or could share other wins. But what could make 2019 your best year ever? Let’s take a look at some steps you can take to increase the chances of 2019 being a great year. To make 2019 one of the best years ever, you have to know what would make 2019 great. Do you know what this is already? If you do, you probably have a list. If you don’t, you need to create a list. Make a list detailing what you need to do on your end to increase your satisfaction. 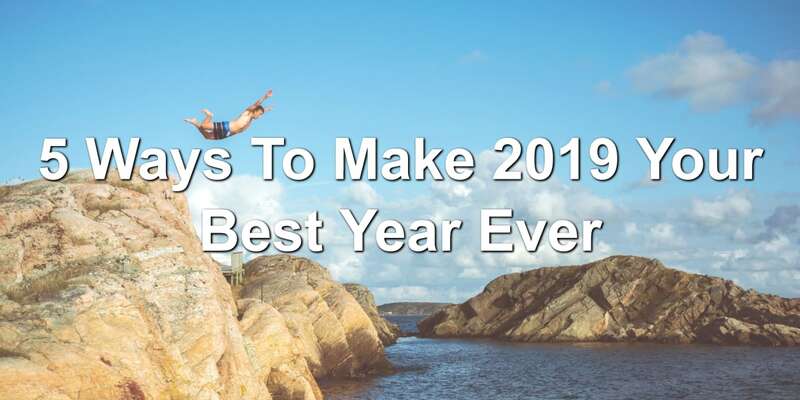 This list will be your guide as you embark on 2019. Detail what wins you need to accomplish. List out what you need to avoid. And let yourself dream of what could be. Far too many of us spend our days locked away inside of a cold, dark building. We don’t get outside into nature enough. Science tells us we’re better when we’ve experienced the sun and fresh air. Then why do we stay cooped up all day long? Find time to get outside and breath the clean, fresh air. Feel the grass on your feet. Bathe in the glorious sun. You need to get out and enjoy yourself outside of the office and away from the worries of work. What better way to do this to go on a date night, with your spouse or just by yourself. Going out with loved ones on date nights will help focus you on one of the reasons you lead. That reason? So you can provide for yourself and your family. Date nights are great. They help you enjoy yourself and relax at the same time. Few people have accomplished much by worrying about what tomorrow will bring. Instead, worrying often prevents you and me from living our best lives. It’s a noose around our necks. Start putting worry behind you. Look at the realities of life and realize most of the bad things you’re thinking about will never come to pass. Instead, focus on the positive. What good things are coming your way? How can you invite positivity into your life? What value can I provide to others? These are the things you need to focus on. You may be tempted to work yourself to the bone. You feel like you can’t leave the office and enjoy yourself. But you can! You can take a vacation or a sabbatical. Find a way to get out of the office for an extended period of time. Whether this is half a week or a month long break, you need time away from work. A vacation is just what the doctor ordered. Pam and I find ourselves taking time off to go enjoy solitude in the Upper Peninsula of Michigan. You may find your time of restoration somewhere else. Whatever you do, you need to find time for a vacation. It’ll refresh, restore, and get you back on track. Question: What other things can you do to make 2019 your best year ever? Share your thoughts in the comment section below.